As with many things in life, with travel insurance, you get exactly what you pay for. That is, if you search for the cheapest quote you can possibly find then you'll end up with a very basic policy from a less than reputable company. More importantly, if you cut corners and tell what you believe to be little white lies, you may find your policy to be not worth the paper it's printed on. Travel insurance is not like car insurance. If you buy an old car for less than say £500 you know perfectly well it's not worth insuring because insurance companies will attach no resale value to it at all, but because the law dictates that you must have insurance for third parties you go out and find the cheapest quote you can find and then write the money off as an unavoidable cost - never ever intending to claim on it. 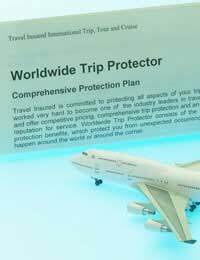 With travel insurance however, there is a chance you'll have to make a claim. A tourist is robbed in the world every 31 seconds according to a study carried out last year; but that's only half the reason why it's important to have adequate insurance - the more important issue is that of medical assistance. In Europe, UK citizens are entitled to emergency medical assistance just as if they were in the UK, and the same goes in several other countries such as Canada and Australia, which have reciprocal agreements with the UK to offer citizens medical care if needed. However, outside our immediate circle of friends in the international community, we are not entitled to free healthcare of any kind - and if you have to pay full price for it, it can be financially devastating. It's highly advisable to research your chosen destination as much as you can before you set off, but if you do nothing else at all you should at least visit the Foreign and Commonwealth Office (FCO) website. This large and highly informative site is the most authoritative source of basic and vital information for British citizens travelling abroad. It gives up to the minute information about volatile areas, political and cultural information, visa requirements and a host of other useful things to know - including where you stand with regards to healthcare and the general likelihood of finding yourself in danger of being robbed or harmed. When looking for travel insurance, you'll soon discover that cover for a trip to the USA is more expensive than that for a trip anywhere else in the world. It's not that healthcare in the US is that much more expensive to an insurance company than anywhere else, butif you were to have some kind of accident and you didn't have insurance, your treatment would cost you thousands of dollars, therefore insurance companies capitalise on your greater need for cover. In addition, you're far more likely to have issues trying to enter America than anywhere else in the world (with the possible exception of Burma) and if you have a good policy with a good company you may well be able to claim for missed connections and other unforeseen circumstances. You'll find out the first time you ever need to make a claim just how good a choice of insurer you've made - unfortunately by that point it may well be too late. One way to pre-empt nasty surprises is to compare policies, not just prices. It's a very time consuming and frankly, boring task, but it helps you understand how the industry works. Another good piece of advice is to go with proper insurers, specialised in travel insurance, rather than banks or supermarkets who offer second hand policies underwritten by general insurers. When dealing with any company, ask yourself, 'How easy will it be for me if I have to call these people at 4.00 am from the other side of the world?' 'How much support and assistance are they likely to offer me?'. It is, naturally, a minefield, but if you look for quality rather than simply the cheapest quote you can get, you have more chance of finding a company that will help you in your time of need. I am travelling alone to meet my daughter in Thailand, it's the first time I have flown anywhere alone.I am a 52 year old female with no serious health issues.My daughter is experienced on lone travel and isvery organised, but I didnt want to burden her with all my travel plans and found your site very easy to use.You supply an enourmous amount of information to the amateur traveller and I can probably astound her with my new found knowledge.